Changes could be for the better – but riders need to be involved! New Links is the year-long process that is intended to make RTA and Jefferson Transit bus lines work better for transit riders. To do that the New Links process could recommend changes in where bus lines go in order to more reliably get people to jobs, school, the doctor’s office, and many other places. It might ask riders to consider tradeoffs like walking two blocks further or making an extra transfer in order to reduce overall travel time. It could even mean real regional transit routes with convenient connections across parish lines! But whether those ideas sound great, make you nervous, or you’re somewhere in between, one thing is for sure. Nothing good will happen if transit riders don’t show up! Keep reading below for a primer on the New Links process. Over the next few months, the New Links team will study each bus, streetcar, and ferry line in the New Orleans region while working with the public to understand what riders and stakeholders most want to see improved. At the end of the project – later in 2019 or early 2020 – the New Links team will propose a redesigned transit network with specific changes designed to make transit work better for riders. The New Links process was called for in the Strategic Mobility Plan (SMP) – the RTA’s 2017 long-term plan. For too many riders, transit is just not reliable. The average transit-reliant New Orleanian can only reach 12 percent of the region’s jobs in 30 minutes-or-less. Too often transit riders have to deal with long waits or buses or streetcars that don’t keep to the schedule. That’s bad for our city and bad for our economy and it really hurts the people who can least afford it. Riders need to see immediate changes – not just plans that may or may not happen in the next decade. Part of the solution is getting more buses out on the streets. And another part of it is making sure that our transit lines are actually going where they’re most needed. New Links can help us prioritize where more buses are most needed and recommend network changes so they’re used in the best way possible to serve transit riders. How does New Links work? New Links will first develop good data on where riders are going and their most important needs. That will be done through a series of community engagement conversations and a formal survey of transit riders. The community engagement conversations and rider data will lead to recommendations for changes to the transit network that could range from small tweaks like changing the location of a transit stop – so a bus doesn’t get caught at a traffic light – to a full or partial network redesign. Where most people live and work changes over the years, but transit networks often don’t. So you wind up with crowded buses that don’t come often enough in some areas, other areas of high need without service at all, and major destinations without direct or convenient transit access to other major destinations or where most people live. A network redesign seeks to address these issues by redirecting some or all of the routes within a transit network to better get people where they need to go. This could be localized – like redesigning routes to better get New Orleans East riders to the rest of the city – or more widespread, like creating a series of new regional routes that better connect riders across parish lines. Our friends at TransitCenter have a primer on the idea. New Links will roll out in roughly three phases. Phase I (roughly April until June): A series of initial community conversations about the process and about what riders really want to see. There will be the April 9 kickoff meeting but there will also be a series of smaller meetings hosted by a wide range of community groups. At the same time, the New Links team will be conducting the rider survey and digging deep into ridership data to determine ridership patterns and areas where buses get delayed. It’s important to note that booking these smaller meetings will be an ongoing process. So if you are interested in hosting a New Links planning team during this initial phase there is still plenty of time! Please let us know via info@rideneworleans.org and we will pass your contact info along. Phase II (roughly July until October): The New Links team will generate a series of different scenarios of what regional transit could look like based on the data gathered and the series of community engagement conversations. They will bring these scenarios back to the community for discussion and comments that will lead to the final recommendation. 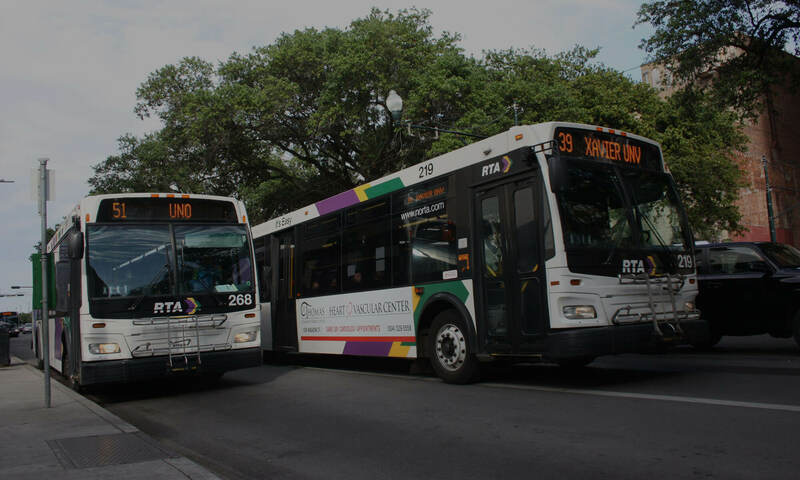 Phase III November 2019 through January 2020: The New Links team will make a final series of recommendations for implementation by the RTA, JeT, and St. Bernard Parish. At that point it will be up to the respective agencies to determine whether they want to implement the recommendations so the last community conversations of the process will be hosted by each individual agency. Please let us know if you have any questions! RIDE is dedicated this year to making sure every transit rider fully understands and can participate in this really important conversation!